Who is not aware of the hot summers of Monterrey? Well, that is supposed to meet some amount of respite with the new MacroMTY design in progress. 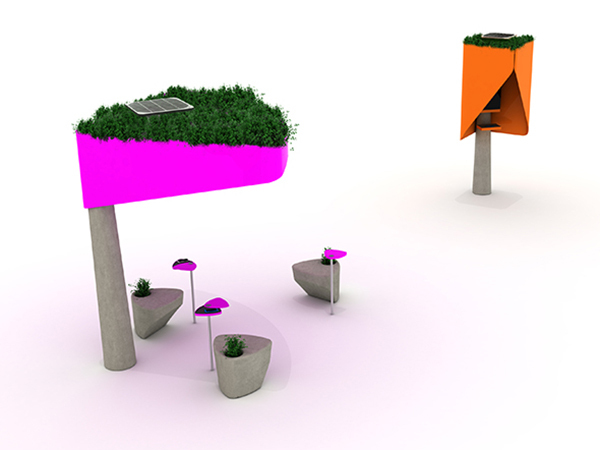 MacroMTY is a kind of kiosk that is being planned to be set up neat the Monterrey Macroplaza. This area has been a posh one since you could find commercial and cultural buildings scattered around it. In short, it is an activity hub, buzzing with all kinds of business activities pacing up throughout the day. The idea came through a proposal given by design studios in the Codigo Magazine’s design special. Now what is so new about this place? Well first, it is a shade that will be built here after a considerable time so that people moving around could halt here for a while for rest and relaxation. But that is ordinary, isn’t it? We find a shade pecked up here and there when we set out foot on pavements! But this one is something special! It is a green shade! The roof of the shade would facilitate the growth of vegetation. This would help ward off the heat even during the hot summer months in Monterrey. Second, the kiosk would be powered by solar energy. There are solar panels installed on the roofs of these kiosks. This makes them secondarily beneficial to the environment. And it is not only shelter and a cool lee from the blazing sun that you can get out of it! There is also an additional promise to make facilities like a phone booth, a Wi-Fi or a video chat available for those who come here for some minutes of respite. Moreover, if your mobile is losing on its back-up charge, you could charge it up as well! The power would be provided by the solar panels installed on the kiosk roof. There would be enough place to sit and rest here. Apart from the utility factor, the look and beauty of this green shelter is also just adorable. This is still in its design phase and the real time development is yet to see its initiation.